As the search for habitable planets continues, astronomers detail how they determine which exoplanets have all the right conditions for life to thrive. There is only one planet we know of, so far, that is drenched with life. That planet is Earth, as you may have guessed, and it has all the right conditions for critters to thrive on its surface. Do other planets beyond our solar system, called exoplanets, also host life forms? Astronomers still don’t know the answer, but they search for potentially habitable planets using a handful of criteria. Ideally, they want to find planets just like Earth, since we know without a doubt that life took root here. The hunt is on for planets about the size of Earth that orbit at just the right distance from their star – in a region termed the habitable zone. NASA’s Kepler mission is helping scientists in the quest to find these worlds, sometimes called Goldilocks planets after the fairy tale because they orbit where conditions are “just right” for life. Kepler and other telescopes have confirmed a handful so far, all of which are a bit larger than Earth — the Super Earths. 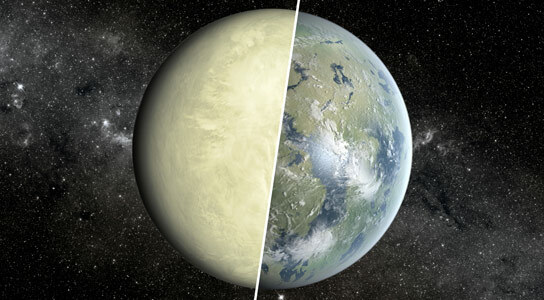 The search for Earth’s twin, a habitable-zone planet as small as Earth, is ongoing. An important part of this research is the continuing investigation into exactly where a star’s habitable zone starts and stops. The habitable zone is the belt around a star where temperatures are ideal for liquid water — an essential ingredient for life as we know it — to pool on a planet’s surface. Earth lies within the habitable zone of our star, the sun. Beyond this zone, a planet would probably be too cold and frozen for life (though it’s possible life could be buried underneath a moon’s surface). A planet lying between a star and the habitable zone would likely be too hot and steamy. That perfect Goldilocks planet within the zone wouldn’t necessarily be home to any furry creatures. But it would have the potential for some type of life to abound, if even microbes. In one new study, researchers based at NASA’s Exoplanet Science Institute at the California Institute of Technology, in Pasadena, California, carefully analyzed the location of both a planet called Kepler-69c and its habitable zone. Their analysis shows that this planet, which is 1.7 times the size of Earth, lies just outside the inner edge of the zone, making it more of a Super Venus than a Super Earth, as previous estimates indicated. “On the way to finding Earths, Kepler is telling us a lot about the frequency of Venus-like planets in our galaxy,” said Stephen Kane, lead author of the new paper on Kepler-69c appearing in the Astrophysical Journal Letters. To determine the location of a star’s habitable zone, one must first learn how much total radiation it emits. Stars more massive than our sun are hotter, and blaze with radiation, so their habitable zones are farther out. Similarly, stars that are smaller and cooler sport tighter belts of habitability than our sun. For example, the Super Earth planet called Kepler-62f, discovered by Kepler to orbit in the middle of a habitable zone around a cool star, orbits closer to its star than Earth. The planet takes just 267 days to complete an orbit, as compared to 365 days for Earth. Knowing precisely how far away a habitable zone needs to be from a star also depends on chemistry. For example, molecules in a planet’s atmosphere will absorb a certain amount of energy from starlight and radiate the rest back out. How much of this energy is trapped can mean the difference between a turquoise sea and erupting volcanoes. Researchers led by Ravi kumar Kopparapu of Penn State University, University Park, Pennsylvania, used this type of chemical information to nudge the habitable zone out a bit farther than previously thought. The team’s 2013 Astrophysical Journal study is the current gold standard in determining how a star’s total radiation output relates to the location of its habitable zone. Kane and his colleagues used this information to fine-tune the boundaries of Kepler-69c’s habitable zone, in addition to careful measurements of the star’s total energy output and the orbit of the planet. “Understanding the properties of the star is critical to determining planetary properties and calculating the extent of the habitable zone in that system,” said Kane. But before you purchase real estate in a habitable zone, keep in mind there are other factors that dictate whether a world develops lush greenery and beaches. Eruptions from the surfaces of stars called flares, for example, can wreak havoc on planets. Flares can also scrape off the atmospheres of planets, complicating the picture further. This is particularly true for the smaller, cooler stars, which tend to be more hyperactive than stars like our sun. Ideally, astronomers would like to know more about the atmosphere of potentially habitable planets. That way they could look at the planet’s molecular makeup for signs of runaway greenhouse gases that could indicate an inhospitable Venus-like planet. Or, future space telescopes might even be able to pick up signatures of oxygen, water, carbon dioxide and methane — indicators that the planet might be somebody’s home. NASA’s upcoming James Webb Space Telescope will bring us closer to this goal, by probing the atmospheres of planets, some of which may lie in habitable zones. The mission won’t be able to examine the atmospheres of planets as small as Earth, so we’ll have to wait for another future telescope to separate out the Venuses from the Earths. NASA Ames manages Kepler’s ground system development, mission operations and science data analysis. NASA’s Jet Propulsion Laboratory in Pasadena, California, managed Kepler mission development. Ball Aerospace & Technologies Corp. in Boulder, Colorado, developed the Kepler flight system and supports mission operations with JPL at the Laboratory for Atmospheric and Space Physics at the University of Colorado in Boulder. The Space Telescope Science Institute in Baltimore archives, hosts and distributes the Kepler science data. Kepler is NASA’s 10th Discovery Mission and is funded by NASA’s Science Mission Directorate at the agency’s headquarters in Washington. More information about exoplanets and NASA’s planet-finding program is at http://planetquest.jpl.nasa.gov. 1 Comment on "How Astronomers Search for Habitable Exoplanets"
Interesting, but if one calculates the odds of a habitable planet with the dozens for things that have to be in place for life, the odds of there being an habitable planet anywhere in our universe are infinitesimal. Also, the odds of even a simple single cell organism are so infinitesimal as to be virtually beyond realistic maths as to be ridiculous. The second law of thermodynamics disallows suitable fantastically complex chemicals (billions of identical copies of each) gathering together in the same place on a planet in the same moment of time and all getting inside a fabulously complex cell membrane. To overturn this law of chemistry is to perform a miracle, and we all know what that means. Time for science to accept the obvious and stop pretending. Life by random processes is impossible.